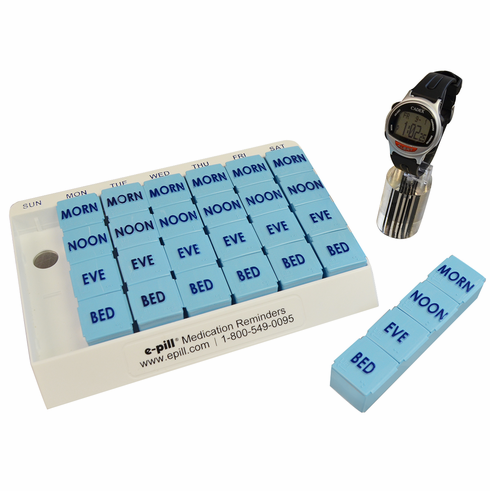 (a) Medication Reminder Alarm Watch with up to 12 DAILY Alarms, (b) Seven 4 Doses per Day Large Capacity Pillboxes (easy to open pill box even for old hands - each pillbox is marked with MORN, NOON, EVE, BED), (c) Parking Tray marked (SUN, MON, TUE, WED, THU, FRI, SAT), (d) Emergency Pill Pack for Pocket or Purse, (e) Refrigerator Magnet Reminder, (f) Reminder Stickers, (g) Medication Chart. - See picture - What's included with your CADEX Compliance Kit. Avoid Medication Errors and Feel Better. How your CADEX Alarm Watch works (VIDEO): Up to 12 daily medication reminders by sound alarm + optional text alarm (no vibration). Long alarm duration (up to 4 hours for each alarm). Alarms reset automatically each day (no reset required). Optional reminder Text Message (name and strength of medication or other prompts) for each alarm. Message scrolls across the display on the wristwatch. All settings are done on the watch -- no computer needed -- easy to set instructions. Used in clinical studies. Recommended by GOOD HOUSEKEEPING. Pill Capacity: 35 Aspirin sized tablets per dose. Four (4) doses per Day in Each Pill Box. Label MORN, NOON, EVE, BED. Seven (7) Pillboxes = 1 Week are included.